So, the corn I put out for the squirrels to try to make them leave the bird seed alone, has been disappearing at a rate of knots. This little chipmunk has found a way to climb up the fence and steal the corn right off the cob. Look at his cheeks !!! He fills up and then buggers off - rinse and repeat. He has no right being so cute either. How can I get cross with him? As someone once said, "Oi, Chippy - NO!!!!". Loves her dad......well, loves his pants actually. 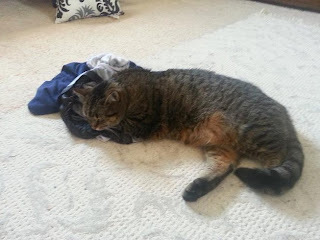 Yes, those are his previously worn pants lying on the floor before making their way to the laundry basket. If she ever finds them there, she loves to snuggle into them. Brave too is our Tootsie. It has been an odd weekend. The weather has been bloody gorgeous. Warm, without being too hot, sunny, dry and very low humidity. I wish the whole Summer - or even the whole year could be like this. Facebook is a double edged sword at times. A friend of mine (at least I thought he was) has apparently got the arse with me for something. I think I know why but I am not entirely sure. He has put me on a 'restricted' list to stop me seeing his page etc. I was upset about it at first and almost deleted him entirely, but now I realise how childish it all is. I have spoken to other people about it and they confirmed my feelings about it all. So, I have decided to let him sulk. I will give him a while to get over it but if he doesn't then I will delete him. Sad really as I was only being honest in the first place.